I’m currently swimming in carrot tops. The farm I work with recently sold a good 30 pounds of baby carrots they had been growing to a woman to make carrot kraut (which I realize sounds strange, but it’s really quite good). All of the greens were trimmed before they sent them off, so I was called to ask if I wanted any. I did; I did indeed. I enjoy making use of “waste”, or at very least, I enjoy trying to make use of as much as possible to produce as little waste as possible. Carrot tops, turnip greens, beet leaves, strawberry leaves- they’re all perfectly edible and are fantastic sources of vitamins and minerals. This week has been a week full of green carrot top smoothies and minced carrot top leaves in salads. 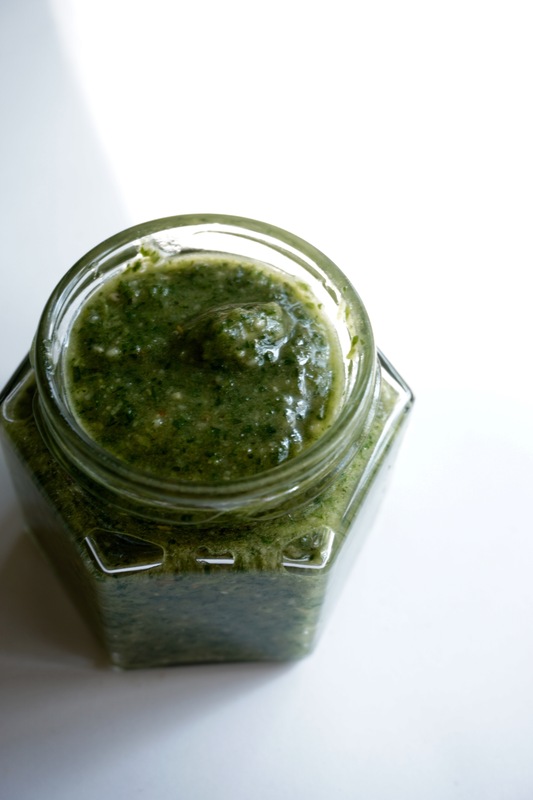 While I pack a lot into my smoothies I started making pesto to try and cut down the supply before they go bad. 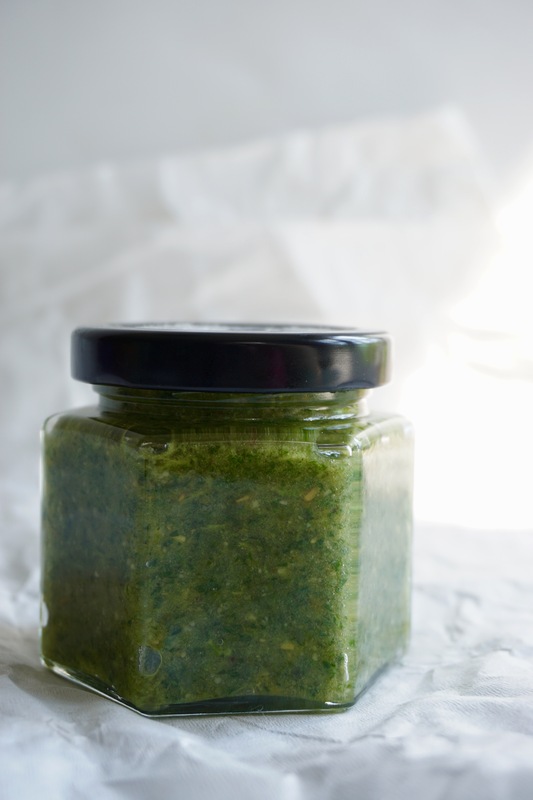 This pesto would make a great sauce over top of veggies but also is fantastic as just a pesto with pasta! 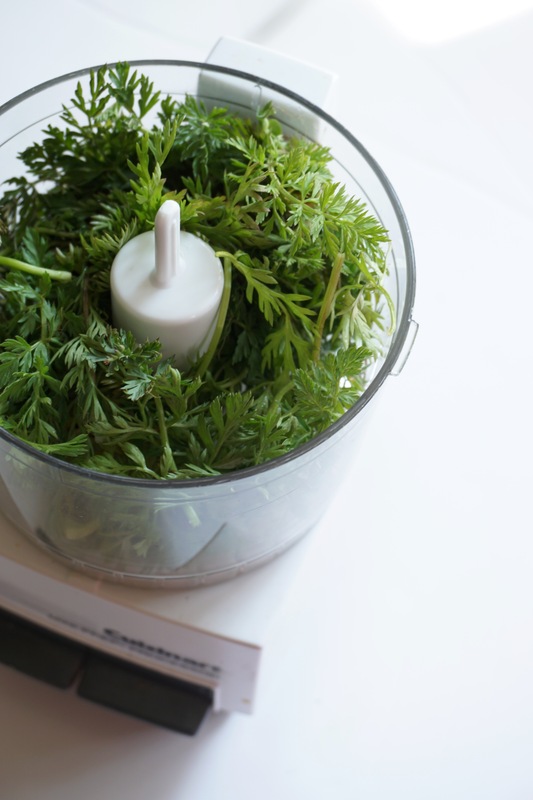 Add carrot tops (really pack them into that measuring cup! ), garlic and pine nuts into a food processor and process until everything is broken down evenly. Stream in the walnut oil and add a pinch of salt. Purée again until smooth. 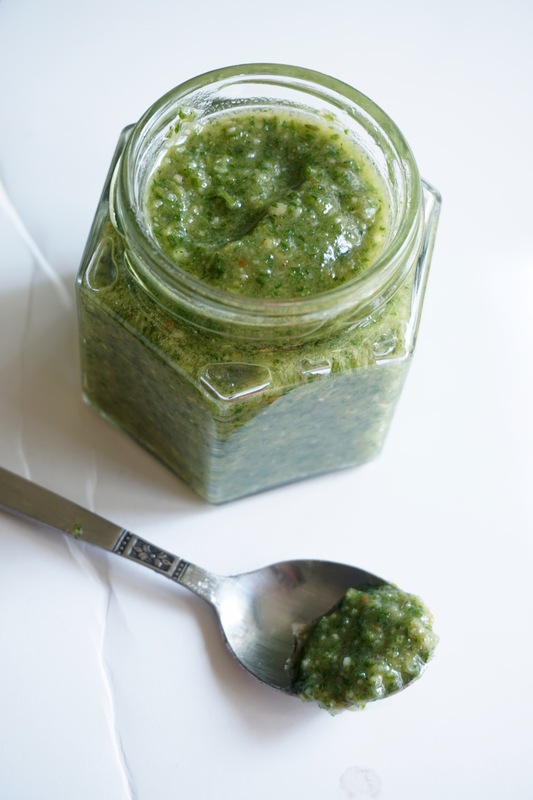 Taste the pesto and add more salt as needed. 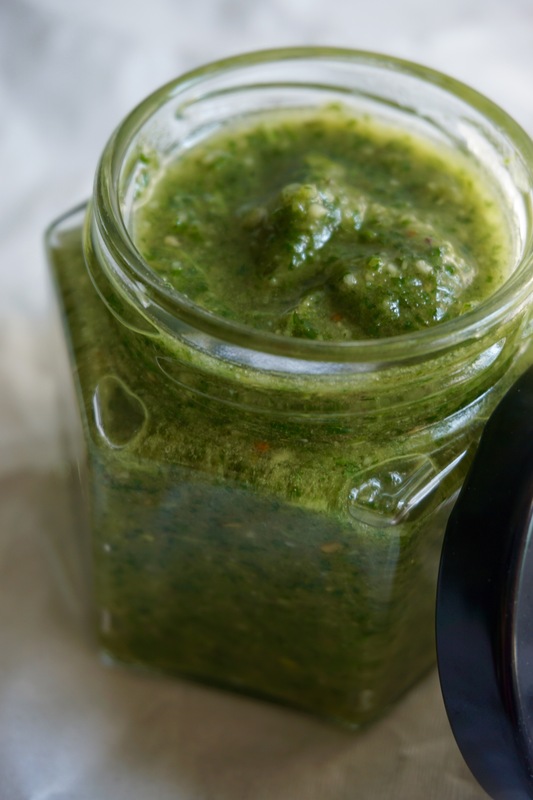 We eat lots of carrots at our house and I love pesto, so can’t wait to try this one!! this is a really great idea! not only did you rescue some perfectly good edibles, but you transformed them into something versatile and delicious! bravo! This is a great idea! I have never heard of this before either. We haven’t planted yet, but eventually we too will be swimming in carrot tops! I will have to try this. 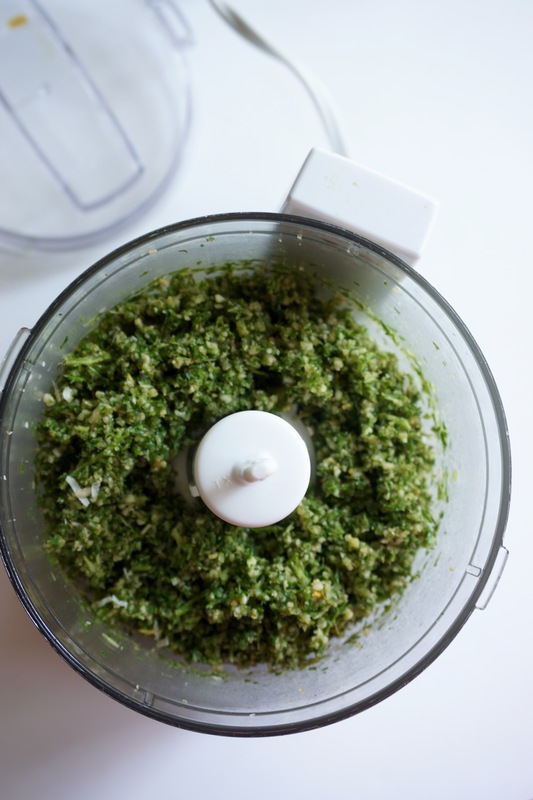 I’ve never thought to try making pesto with carrot tops, sounds like something I’d love to try. Looks really delicious, and I really really love the idea of using up every bit of the carrot.